The Catacomb of Callixtus was built along the Appian Way, probably by Pope Calixtus in the early third century. As Christianity became prominent, catacomb remains were moved to churches and catacombs fell into disuse. 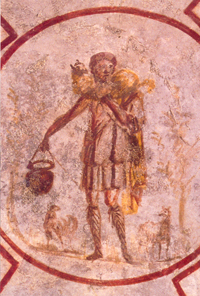 Catacomb of Callixtus - The Good Shepherd, from Art in the Christian Tradition, a project of the Vanderbilt Divinity Library, Nashville, TN. http://diglib.library.vanderbilt.edu/act-imagelink.pl?RC=54382 [retrieved April 20, 2019]. Original source: http://www.flickr.com/photos/jimforest/2594526135/.